A group of students travelling without tickets in an air-conditioned railway coach in the northern Indian state of Bihar were recently asked by the ticket examiner to vacate their seats. Nothing unusual about that, but, in this case, the students took umbrage, and set four coaches on fire. Panic-stricken passengers on the train travelling between the Indian capital, Delhi, and Rajgir in Bihar, ran out with their bags at Bihta station while the police and railway security looked on helplessly. Railway authorities totted up the losses: each air-conditioned coach costs eight million rupees ($161,000; £98,000) to manufacture, and the losses from the Bihar incident cost the railways nearly $650,000. 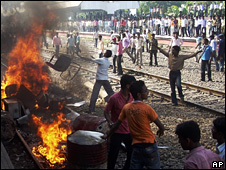 This incident again proved that burning trains have become a popular form of protest and vandalism in Bihar. In June, two passenger intercity trains were attacked and six coaches burnt down by a mob at Khusurupur station - the attackers were angry with the railways after it scrapped an illegal "halt" for an intercity train at the station. In Bihar, people routinely hop on to trains from such illegal "halts" where trains are forced to stop. Last October, a mob burnt down two air-conditioned coaches of an express train connecting Bhagalpur with New Delhi at Barh railway station. They were protesting against violence against migrant workers from Bihar in the faraway western city of Mumbai. Train travel in Bihar has been always fraught with dangers with aggressive ticketless travellers and train robbers looting passengers. Burning down trains is just the latest threat. 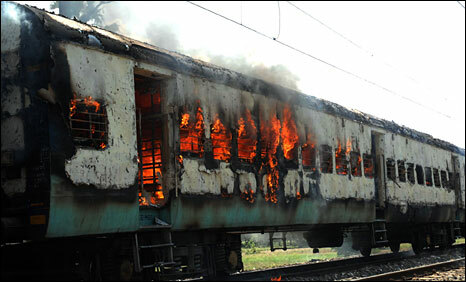 But why do people in Bihar vent their ire on trains and set them on fire? A senior police official, Neelmani, says people think authorities will take note of their grievances if they burn important public property like trains. "When you target railways, you disrupt movement of trains for several hours and then your voice reaches the concerned authorities," he said. Railway official Gyan Prakash Srivastava says people who attack trains have no respect for public property. "I believe it is because of the lack of public awareness and respect for government property." Bihar Chief Minister Nitish Kumar is dismayed by the train burning spree in his state. "Railways are our lifeline and a government asset. I have asked my officials to go through station video footage and arrest the vandals," he told the BBC. In fact, trains are attacked in Bihar over every other issue. Earlier this month, students protesting the murder of an owner of a private teaching institute ransacked the Lakhisarai railway station and disrupted the movement of trains. The very next day, four passengers were shot inside an inter-state train at Punpun railway station after a row between two groups over seat sharing. 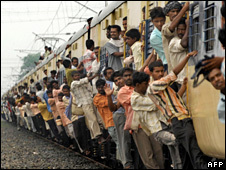 Locals say travelling by train in Bihar is becoming increasingly dangerous. "Anything can happen to you - you could be robbed, drugged, shot for a seat, thrown out of the coach for refusing a bribe to the police, or have your coach burnt down by an angry mob," says Sanoj Kumar, a bank official who is a daily intercity passenger. There is even a gang going around whose members routinely rob passengers after spiking their food and drink with sedatives. Every day, five to six passengers drugged and looted by the gang are reported in Bihar, says Umesh Sinha, railway superintendent of police. Some of these victims have died of an overdose or have been admitted to hospital, he said. Then there is the problem of illegal "halt stations" where trains are forced to stop by local people - there are more than 100 of them in the state, many with actual names: some are named after local politicians and one even after a former president. And yet while rail travel is unsafe in Bihar, seven federal railway ministers have come from the state.